draft dusted off – Hello Korea ! The streets of Seoul have a soundtrack to them. Music is a big part of people’s lives here, and it’s evident everywhere. It’s all hi fidelity, studio mastered and overly produced, except for when the old people have their radios tuned to something called TROT, which is belted out and full of vibrato and is kind of equivalent to a cross between pop ballads and show-tunes. (Think of M*A*S*H and the kind of music being played in the 50’s) Pop rules here, and has since the radio became common-place. So walking the urban streets is an experience of hitting zones of sound, quickening your step. But to me, after having been in the caribbean, it still seems insulated and sterile, simply because I never hear live music and people’s reaction to what is being played is so reserved. There’s just not the excitement of people so moved by music as to drop everything and dance, or pick up a trumpet and practice. There are no street musicians. Occasionally you’ll run into free public performances at selected locations or promotional events, but nothing is spontaneous or done for individual enterprise on a grass roots level. I wish I could play an instrument. I’d be out there busking, just to set an example. I also tried to convince my rueda friend to take dancing to the streets, but he kept talking about finding a loud enough boom box, which I never really needed so don’t understand. And, like every other salsa teacher I’ve met, it’s all about growing a class, which I also don’t understand. Dance should be given away. Everything that makes people feel good about themselves using the body they already inhabit and the skillsets they already have (if you can walk, you can dance) should be shared for free, in my opinion. The bulk of the music is the ubiquitous Kpop, and as much as I think it’s insipid, I have to admit it is catchy, and teenagers will be singing it as they shop. Often times, bars will pipe their music to the street and it will be American pop or jazz. And then, in the college areas clubs will blast hip hop and the never changing, unfortunately never dying pump of the club noise some call music. On the subways, half the people are listening to their Ipods and some are singing to themselves, sometimes audibly. Sometimes, a bagpipe rendition of Amazing Grace will carry through the car and it will be coming from a blind person soliciting for donations. If you are at or near a subway station and you hear oldies folk or pop songs blaring, it is usually coming from what I call the mermen. These are the men with fins instead of legs. The fins are made of black sheets of rubber and used to protect their withered limbs, because their half paralyzed mobility is achieved by laying their torso upon a dolly and pushing themselves forward with their arms while dragging their fins behind them. In front of them will be an amplifier, also on a dolly, and a box or basket for change. It’s a horrific sight to see, especially because Korea’s weather is so extreme: especially the brutal sun. On hot days (of which there are sooo many) where people with working limbs are panting for air, who can move and catch air or run for shelter, these mermen bake: bake under rubber. I can’t imagine how blistered or ulcerated their skin must be under that rubber. And they are so dirty, as of course you’d be when you spend your life half of your body being dragged on the ground, the other half only inches from the ground, your hands as feet. Sometimes you can see glimpses of their skin, and it makes me wince. It’s so disturbing. I mean, Seoul is a world class city. I can’t express how much money changes hands here each and every day. The amount of shopping that goes on, the amount of conspicuous consumption, the amount lavished on interior design and …It’s as if Korea just skipped several chapters in economic development. or political maturity. They went from agrarian to chaebol (conglomerate companies) overnight and just went straight to Raeganomics, with a populace who doesn’t want to pay for any social services and a government that wishes democracy wasn’t so damn democratic. Maybe all of the above systems would work if the corporations and political cronies appeased the masses better, weren’t so greedy and corrupt and had job training, etc., (I’m of the personal belief that all political systems could possibly work if they had no competition and operated in a closed system, but since we don’t live in a world even remotely resembling that, I’m of the personal opinion none of the political systems work) but what, what about the mermen? 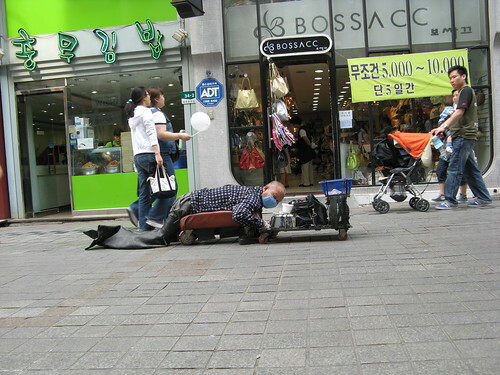 Now, I don’t know why these men don’t have wheelchairs or why society can’t at the very least provide them with that. But I suspect that if they HAD wheelchairs, then they wouldn’t be pitiful enough to beg anymore, and since society won’t allow them any more productive role or give them enough support to live, then they have no real options but to develop really strong neck muscles. And so they bake, like beached fish, and hope that individual people will be more generous than society at large. In the Jongro area, In Itaewon, and any of the major tourist centers of Seoul are busloads of tourists. These busloads of tourists are Asian tourists, and the majority of those are from the Philippines. They are here because of Hallyu, the Korean wave. Korean dramas and Kpop music are adored by most of Asia. Especially in S.E. Asia, Korea is seen as living the life. It’s the American dream, Korean style. And Korea’s got this formula down when it comes to image and entertainment. Which is exactly why I don’t like it. But Asia eats it up. They come to Seoul to see the conspicuous consumption, where it really is like in the movies, where you can buy Bulgari watches and Coach handbags and Prada shoes and drive an imported Mercedes, get your eyes, nose, and breasts improved, and rave all night at clubs with exclusive guest lists. The tourists hear Korean music and this is what they think of. I hear Korean music and after the image of vapid infantalized girls or tramped up girls disappears, I am left with nothing but mermen. Let’s just say I have an uncomfortable relationship with music in Korea. ← Typhoon to possibly hit Seoul today!